I’m writing to ask you to join me in donating to the Barbara Brenner Rapid Response Fund at Breast Cancer Action. This special fund honors Barbara’s work to create an organization able to respond at a moment’s notice to breaking news about breast cancer. Despite the activism of Barbara, Breast Cancer Action, and many others, women continue to be diagnosed with and die of breast cancer, and there is still so much to be done. And despite all the radio and television ads we hear about new treatments for breast cancer, most treatments offered to patients today are no better than those that Barbara was offered when she was diagnosed in 1993. While there are some new targeted treatments, many of these are highly toxic, have not been proven to extend survival, and are stunningly expensive. What we’re seeing is boutique medicine, available to those with access to information and innovative practitioners, with little evidence of improvement in treatment experience or ultimate outcomes. In this context, we need to make sure that Breast Cancer Action has the resources they need to push for a patient-centered research agenda that benefits all women at risk of and living with breast cancer. We need BCAction to push for laws and regulations that prioritize patient safety over pharma profits. We need BCAction to be able to make critical assessments about new drugs, keep us informed, and advocate on behalf of patients. I hope you will join me in making a donation to Barbara’s Fund so BCAction can continue this important work on behalf of breast cancer patients. Barbara’s book, So Much to Be Done: The Writings of Breast Cancer Activist Barbara Brenner was published by the University of Minnesota Press this year. Along with many wonderful people, I appeared at about 20 events to introduce the book to people in California, Washington, Massachusetts, New York, Maryland, England, Italy, and Spain. At these events, we emphasized that the work of activists is ongoing and never-ending. 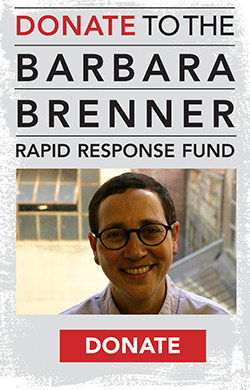 Please join me in continuing to support Barbara’s work by contributing to the Barbara Brenner Rapid Response Fund this year. A donation to BCAction is a direct investment in activism for social change to benefit all our health.